Armed Lutheran Radio is a podcast about faith, firearms, and freedom. We do more than just talk about guns. We talk about self-defense, hunting, reloading, the shooting sports, politics, and gun rights. But we also keep in mind the bigger picture. What does God’s word say about all this? The issue of guns is a hot debate in America. As a gun owner, host Lloyd Bailey wanted to know how he as a citizen of the Kingdom of the Left (the state) and the Kingdom of the Right (the spirit) should think about gun rights and the use of potentially lethal force in self-defense. As an American, we have rights under the Constitution. As a Christian, we have a higher authority to answer to. Lloyd began to research the subject and, as with many subjects related to guns, found lots of information that was misleading or just downright false. In too many cases, American Christians try to make God’s work fit their political preferences. They take Scripture out of context and use it to support a variety of social justice agendas, rather than serving God. The search for truth led Lloyd and his family to leave American evangelicalism and to join the confessional Lutheran church. In 2012, Lloyd founded the Armed Lutheran blog and began writing about the intersection of faith and firearms, and shedding light on what God’s word actually says about our rights as a parent, and a citizen in the world. 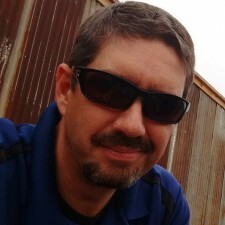 In January 2016, Lloyd founded Armed Lutheran Radio, which was originally intended to be an audio version of the blog, with weekly news, reviews and commentary. Drawing on his experience in AM radio from the late 80s and early 90s, Lloyd envisioned a show format with distinctive segments broken up with rockin’ music to indicate transitions from one subject to the next, rather than a single, show-long dialog about guns. This was a prescient idea which paid off as contributors began to join the show. The first was Sgt. Bill Silvia, a veteran of the Dallas Police force and master class competitive shooter. Bill’s segment, The Ballistic Minute, focuses on competitive shooting tips and has been a weekly feature since day one. Next came Pastor John Bennett from St. John Lutheran Church in Willow Creek, Minnesota. Lloyd had an idea for a segment to debunk articles that misuse scripture to support gun control and Pastor Bennett volunteered for the project in episode five. And in week 28, Lloyd interviewed Mia Anstine, a blogger, writer, speaker, and hunting guide. Mia was only the third woman ever to appear on the cover of Field & Stream Magazine. She joined the team in episode 29, and her weekly segment, Mia’s Motivations, covers everything from hunting to women’s issues related to firearms and self-defense. 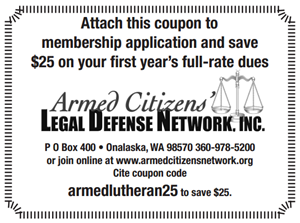 In August 2016, Armed Lutheran Radio joined the new Self Defense Radio Network, and the show now airs weekly on KRRC 94.3 The Bridge in Rogue River, Oregon. The show is released weekly, Sunday nights at midnight GMT (6pm Central) on iTunes, TuneIn, Stitcher, Google Play, and other podcast services.